Tom Gallaher, the son of an Irish farmer, started his own one-man business in 1857 at the age of 17 by making and selling roll pipe tobaccos. By 1888 he had offices in Belfast and London. Gallaher produced its first set of cards, The British Army, in 1897. The company issued its first set of football cards in 1910. Football Club Colours was a set of 100. The next set published in 1925, Famous Footballers, was also a set of 100. 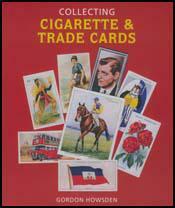 The following year they published a second series of these cards. In 1928 Gallaher published Footballers in Action. These were painted scenes from football matches. These cards are in short supply and sets cost in the region of £130.